Jorge is the General Director (2007), and co-founder of Comunidad y Biodiversidad, A.C. (COBI, 1999), a non-governmental organization that focuses on marine biodiversity conservation and sustainable fisheries through effective participatory approaches. He obtained his PhD from the University of Arizona (2002). 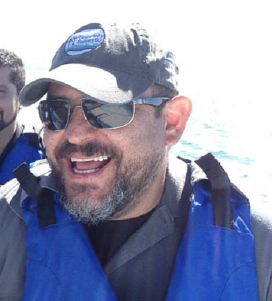 Jorge has been working in marine conservation and sustainable fisheries in Mexico since 1988. His research has been based on generating practical answers to marine conservation and unsustainable fisheries problems combining biophysical, socioeconomic, and governance information. He has participated as a speaker in more than 50 congresses and symposiums, and has collaborated in more than 50 peer-review publications. At the UN Our Oceans 2016 conference – coordinated by former John Kerry, US Secretary of State – he presented COBI's capacity building program for fishers and cooperatives model as part of the Sustainable Fisheries panel. This provided a unique opportunity to present COBI's work to the world and to be the voice of the fishers. COBI was the only participant that mentioned the importance of including fishers in conservation and sustainability efforts from the day one. In 2012 Jorge obtained the Arizona Sonora Desert Museum Conservation award. Q: What are you currently working on within the context of SSF? JT: I am focusing on promoting equal gender participation in small-scale fisheries decision-making processes. It is well established that gender equal teams achieve better results that just single gender teams. In addition, women prefer to expend the time used on planning and thinking in sustainable management in comparison to men, who fish to obtain profits. During the decision-making process in fisheries, in the majority of the cases, only men are included since fishing is seen as a "men's" activity, while women are predominantly seen as "helpers". Nevertheless, women are part of the fisheries where they play important roles that include eviscerating, registering, managing accounts on the beach, repairing gear, processing, selling and preparing the fish products. If we don't include the women, we will miss on the opportunity to develop creative solutions and balanced decisions. Q: If you could single out one or two most significant factors for securing sustainability of SSF, what would these factors be? JT: First is to stop trying to achieve sustainability with one "hammer" or tool. Achieving sustainability has to be done through an interdisciplinary collaboration, hand-in-hand with the main users of the marine resources, and with a long-term vision (within 50 years or more) while also being able to obtain tangible, short term results (within 3-5 years). Secondly, we need to ensure that sustainability, besides providing direct financial gains, also provides social benefits to the users .